Although OfficeTools WorkSpace offers many ways to do billing, there is always time that is tracked after the invoice, time that was forgotten or misplaced, or the billing practice itself that requires time to be added to an invoice that already exists. To add time to an invoice that already exists you need to follow a very specific but direct set of steps. Although there is more than one way to add time to an invoice the following is what is recommended. First go to the Billing tab and access the Invoices button. If you are not already on the desired client, make sure to select them in the Contact List on the left. Next, navigate to the invoice that needs the time added and right click on that invoice. 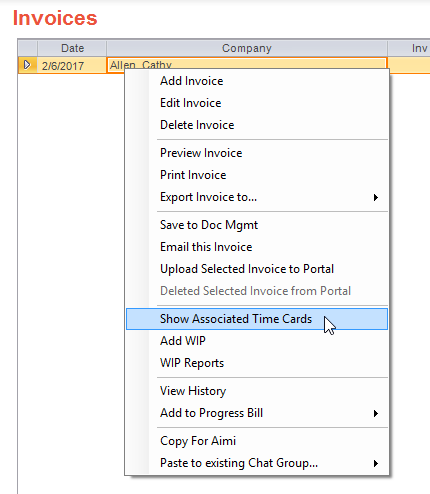 From here a menu will pull up that allows for many options, however the option you want to select is “Show Associated Time Cards”. This will open a screen that allows you to see all the time that is already associated to the invoice and the adjustments any of the entries received. From here you need to select the Add button. A screen that displays all the UNBILLED billable time for that client will populate and in this screen, you are able to choose, using the check boxes on the right of the screen, which time entries you would like to include on the invoice. Be careful to choose the right entries here. Once all the desired time has been selected, choose OK. There will be two prompts that follow. The first prompt will tell you that adding the new time will require new line items and existing descriptions may be lost. Depending on the type of invoice you are using (work code, summary, project, etc.) there may be new line items that are added to the invoice. If you want to add the time, you must accept this prompt. In most cases this will not affect your invoice at all, but keep it in mind and double check your invoice if there are concerns. The second prompt will ask if you would like to update your invoice amount to the new total of the time cards. In most cases, you will want to say no to this prompt, especially if you have already sent the invoice to the client. If you were billing $1000.00 in time and you added $200.00 worth of time, you would change your invoice total to $1200.00 by answering yes to this prompt.